Mariam Ghani is an artist, writer, filmmaker. Her work looks at places, spaces and moments where social, political and cultural structures take on visible forms, and spans video, sound, installation, photography, performance, text and data. Ghani has exhibited and screened at the Guggenheim, MoMA, Met Breuer and Queens Museum in New York, and the National Gallery in Washington, D.C., the Saint Louis Art Museum, the Indianapolis Museum of Art, the CCCB in Barcelona, the Rotterdam and CPH:DOX film festivals, the Sharjah and Liverpool Biennials, the Dhaka Art Summit, and dOCUMENTA (13) in Kabul and Kassel. Her writing recently has been published by e-flux journal, Frieze, and Foreign Policy, as well as in the books Assuming Boycott: Resistance, Agency and Cultural Production, Critical Writing Ensembles, Dissonant Archives, Social Medium: Artists Writing 2000–2015, and Utopian Pulse: Flares in the Darkroom. Ghani has received fellowships, awards, grants, and residencies from Creative Capital, Art Matters, the 18th Street Arts Center in Los Angeles, the Schell Center for International Human Rights at Yale Law, and the Center for Constitutional Rights, which gave her its inaugural Changemaker Storyteller award in 2017.
International Art English was published as part of Triple Canopy’s Immaterial Literature project area, which receives support from the Andy Warhol Foundation for the Visual Arts, the Brown Foundation, Inc., of Houston, the Horace W. Goldsmith Foundation, the Lambent Foundation Fund of Tides Foundation, the National Endowment for the Arts, the New York City Department of Cultural Affairs in partnership with the City Council, the New York State Council on the Arts, and the Opaline Fund of the Jewish Community Endowment Federation and Endowment Fund. Issue 24, Risk Pool, was made possible through the generous support of VIA Art Fund. In “International Art English,” Alix Rule and David Levine describe the language of contemporary art by analyzing a corpus of press releases sent by e-flux, which is paid to do so by museums, biennials, publishers, and art fairs in order to reach a subscriber base of more than ninety thousand art professionals. The essay appeared in 2012 and soon surpassed the popularity of every other Triple Canopy publication. “International Art English” generated innumerable conversations about the relationship between language, legibility, and power in the art world: columns in the Guardian, polemics in e-flux’s online journal, debates at conferences for art historians, and spirited threads on MetaFilter and Reddit. Suddenly, IAE was inescapable. This ebook—which is functional on all common devices, not to mention being accessible offline—includes “International Art English”; sentence trees that illustrate IAE’s lexical, grammatical, and stylistic features; a forum on IAE convened the year after the essay’s publication; a response by the artist Mariam Ghani, who participated in the forum; and a retrospective evaluation of the IAE phenomenon by Triple Canopy’s Alexander Provan, who edited the essay. 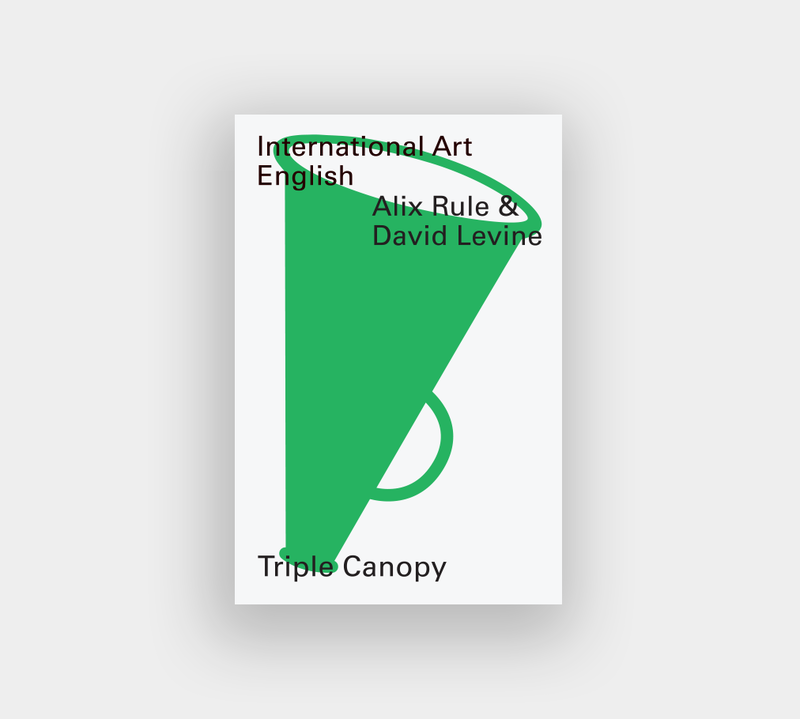 Our DRM-free ebooks are built using a template designed and developed by Triple Canopy. The template and software for producing our ebooks will be released as an open-source project on GitHub in 2018.